. : Optics & Photonics Focus :: A Close Up on Matter :. The atomic hologram. The experimental setup developed in Japan uses electrons to excite the emission of x-rays from titanium atoms in strontium titanate (molecular formula SrTiO3). The emitted x-ray waves interfere with the waves scattered by the surrounding atoms, thus forming a hologram of the 3D atomic arrangement in the material. Quarks, leptons, Higgs bosons... In a 27-km-long particle accelerator in CERN (Geneva, Switzerland), researchers from all over the world are currently working to unveil the most intimate nature of matter, well below the atomic level. Compared to such an epic effort, imaging the 3D configuration of atoms in a material could sound like a relatively simple task. Surprisingly, even this task usually requires similarly large experimental facilities. Now, a new technique from Japan could soon make 3D atomic images affordable even to relatively smaller laboratories around the world. 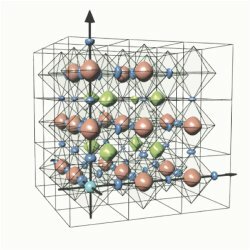 Why obtain 3D atomic images in the first place, though? Because knowledge is power. This famous quote by English philosopher Francis Bacon (1561-1626) is especially true in the case of materials whose physical and chemical properties are controlled by their exact 3D morphology, structure and composition. The ability to image these characteristics, therefore, could help us engineer and develop devices on the atomic scale. With this goal in mind, different techniques have been developed over the years in order to help us acquire knowledge about the 3D configuration of atoms in a material; such techniques, however, need very large and expensive setups. In particular, holography turned out to be a very powerful ally as far as 3D atomic imaging is concerned: holographic-based techniques, now collectively known as atomic resolution holography, can in fact obtain real 3D images of atoms around specific elements without prior knowledge of their structure. How does atomic resolution holography work? In optics, a hologram encodes the interference pattern between a reference beam and the light scattered by an object. The hologram can then be used to recreate the impression of the object when illuminated with the same reference beam used for encoding. Similarly, in a material, the electron, x-ray, or neutron waves emitted by an excited atom (the reference beam) are scattered by its neighbors (the object), thus forming an interference pattern with the scattered waves (the hologram). Exactly like in optics, the recorded hologram can then be used to recreate the 3D atomic arrangement around the emitting atoms. The reconstructed image. This 3D image shows the atomic structure of strontium titanate (SrTiO3) as reconstructed with the new technique: green, red and blue objects correspond to strontium (Sr), titanium (Ti) and oxygen (O) atoms respectively. While the most widely used type of atomic resolution holography (photoelectron holography) typically uses x-rays to excite electron waves, the new technique (internal detector electron holography) inverts this practice by using electrons to excite the emission of x-rays. "All of the conventional atomic resolution holography methods need strong, and tunable-energy x-ray or neutron beams from huge experimental facilities, such as synchrotrons or reactors," explains Kouichi Hayashi at Tohoku University (Sendai, Japan). "Our internal detector electron holography can measure holograms with electron beams from commercial electron guns," thus enormously reducing the size of the facilities needed to carry out this kind of experiments. 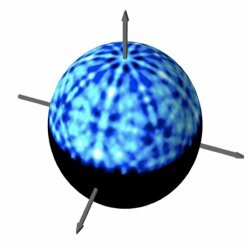 "The novelty of internal detector electron holography is in using ingoing, rather than outgoing, electron wave scattering to produce a hologram," points out Charles S. Fadley at the University of California (Davis, California). "The method has a great advantage over photoelectron holography in that it is possible to use it in many laboratory settings with electron microscopes, whereas photoelectron holography requires a tunable-energy synchrotron radiation source." Speaking of their future research plans, Hayashi explains that they will initially focus on studying physically interesting materials, and eventually move towards more technological applications involving energy materials such as solar cells and catalysts. In terms of applications, Fadley also believes that "this method will be very useful in studying nanocrystalline and thin-film materials, in conjunction with SEM analysis. It could also be applied to time-dependent processes in which the sample is subjected to some kind of excitation, for example by heating, exposure to a laser, or other means." As far as Fadley is concerned, conventional photoelectron holography still has some advantages over the new technique; nevertheless, he goes on to add that he views this as a "nice breakthrough, and a method that should permit the determination of local atomic structures, including bond directions, over the first few spheres of atoms, more accurately than is possible via the widely used technique of extended x-ray absorption fine structure." And he concludes: "Being able to image short-range atomic structures directly via a truly holographic method is a long-sought goal in materials physics, and this method is a powerful new approach to this that should be available to a broad user community, with implications for a large range of complex and nanostructured materials in semiconductor electronics, magnetics research, and energy conversion." Akio Uesaka, Kouichi Hayashi, Tomohiro Matsushita & Shigetoshi Arai, 3D Atomic Imaging by Internal-Detector Electron Holography, Physical Review Letters (2011) 107, 045502 (link).